The following video is submitted as possible evidence of the Iridium satellite launch on December 22, 2017. Mark James Gordon posted this from Ventura, CA while looking northwestern towards, apparently, Vandenberg Air Force Base, which is 1.5 hours away by car. Funny how he called the unknown cloud beautiful. Other posters on his YouTube channel identified the cloud as most likely being from the SpaceX launch. People in Phoenix say something weird like this was in the sky. I know people in Phoenix who saw something that they say somewhat matches videos and descriptions of this firework. In my opinion, this was meant to be a display to be seen as, I believe, a low risk gambit by the military showing us just how little we can tell what is going on. For most people, it will simply be evidence that SpaceX doesn't lie, they do put "satellites up there" and there is no deception whatsoever behind the "offerings" of SpaceX to the Psience gods. Let's go into the Iridium scheme later. The (simulated?) physics of the thing may be telling in some way, however. As flacid as these puffs get when they try to broach the Karman line, we see the 'plume' gradually widening in space and thinning in substance. It is more or less as we described and predicted in the "Does Rocketry Work Beyond the Atmosphere?" topic. My very crude calculation indicates that given around 800 kilometers distance from Vandenberg, from Phoenix's 1000 foot elevation, roughly 50000 meters of "sky" may be covered by Earth's hump/bulge/curve/love handle. (I am being generous, as it may only be something like 32000 given refraction or whatever else you want to call the effects. Say — let's go with that term — "effects".) This indicates, sloppily, that if an object climbed 35 kilometers above Vandenberg it would certainly begin to appear above the horizon of Phoenix. If it approached the Karman line, it would reach 35 kilometers more "above" the horizon. Out of a "hemisphere" of sky 2450 km in sphere segment (drawing a sphere whose center is Phoenix and whose invisible periphery is, say, 777 kilometers away looking directly "past" the horizon, and cut off at the horizon) we see that 70 km up would be up 1/70th (2450 / 35) of the entirety of the visible sphere segment of the sky. Forgive me if I'm being over simplistic but a flacid launch spewing out every bit of might humans are capable of with rocket power would put the thing in the sky without it needing to reach "space". This doesn't add any curve calculation or the fact that we are looking at the "thing" flying along almost horizontally, almost as if its impotency begins shortly after reaching "mountain climate" height. The plume widens, it runs out of air, it begins to fall and needs to race out of sight before it is noticed that it never actually broached the Karman line. Could this be? I propose, for the time being, that zeppelin style devices may be what "Iridium" is all about. This would also explain bright "Iridium flares" said to be visible when sunlight shines off of what may be large silvery canvases (rather than unlit, awkwardly angled, refrigerator-sized devices). I propose the "rocket" is a fireworks display while the true operation is done in secret timing to prevent tampering and upkeep the illusion of rocket-based satellite launch. When the thing first emerges from the smoke, it looks like a giant condom! I am going by instinct here, no math. If the thing is really as far up as we are told, then the distance indicated by the arrow (below) must be considerable. But at certain times in the video I see exhaust covering that same distance in a few seconds. Or is it just a video artifact? Just had an update to this. In Phoenix they say it was like a "wall of light" moving horizontally across the sky. 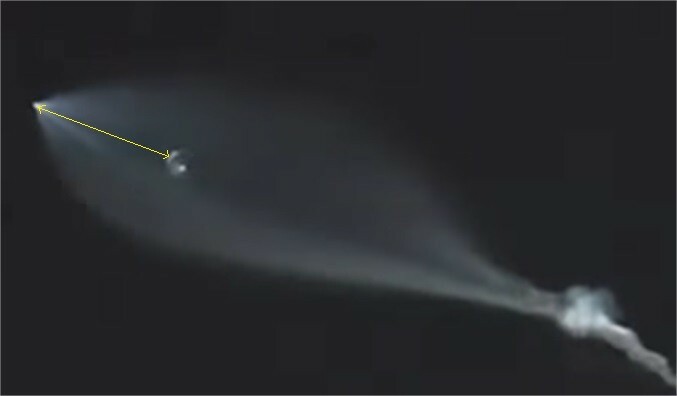 This is consistent with our prediction that the rocket basically reaches a certain height, its thrust diffuses into an almost perfectly perpendicular expansion out of the nozzle due to lack of volume of the air, and the rocket does not reach any higher. I am surprised that they would allow average people to confirm this observation. Witnesses across the Sonoran desert reported seeing this object at "roughly 10 degrees" in the sky. I wonder if they weren't being generous because the conclusion was that it wasn't seen "very high". From Phoenix, one may imagine that we are 1000 feet up. But climbing up as high as Flagstaff we might say we are looking from about 4000 feet up though peaks in the area that can get up to 6000 and 7000 feet. Just given an overly simplified calculation of 28 or so kilometers hidden below the horizon and about 72 to go before the Karman line, we reach that figure of 72 = 1/34 of 2450. Out of a conservative 180 degree arc of sky (ignoring refraction) that's a 5.3 degree height. Given the object reaches (but does not exceed) the Karman line, this could have been observed "within" Earth's limitations at about 5 degrees above the horizon, and this doesn't account for the object's travel closer or further from us as we observe it. According to one-minute astronomer, ten degrees up is about a fist and 5 degrees up is the equivalent span of your three middle fingers of one hand held together. If the object managed to hop the Karman line by 60 km, if for a moment, it seems we may have seen it at ten degrees before watching it fall back down to Earth, which NASA might poetically call "orbiting" before they secretly recover it from the ocean. But the difference from our home perspective, of five or ten degrees, would seem almost trivial. Hmm. And if the object were just 80 km closer by the time of its disappearance (78.5 = 1/28 of 2200 km sky) it could reach 6.4 degrees at the Karman line. If it were 200 km closer, (87 = 1/20 of 1813 km sky) it could reach 8 or 9 degrees at the Karman line. If I am doing this correctly ... if someone else would like to check my math, I'd appreciate it. Do any of the videos even show the thing higher than 10 degrees? It doesn't seem very "orbital" to me. Sounds more like a speed boat jetting along upon the ocean of air surrounding us.